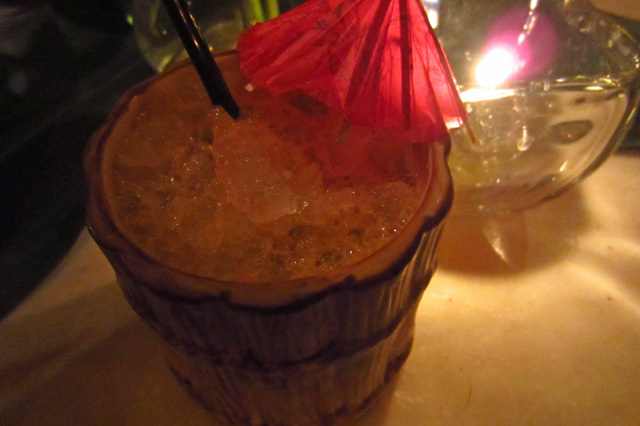 As Los Angeles continues to endure a sweltering heat wave, the timing couldn’t be better for three stellar tiki events taking place over the next several days. 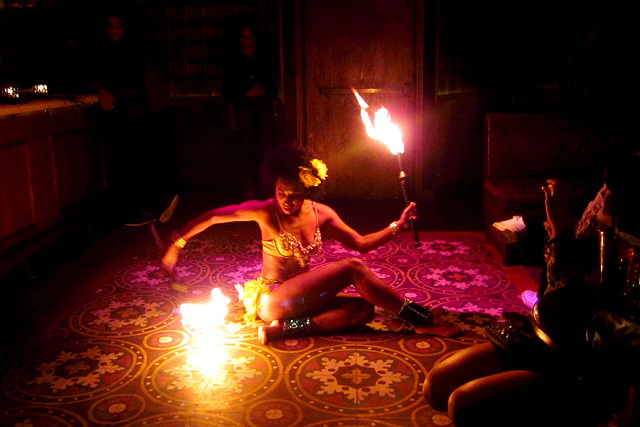 It all starts on the eve of Tiki Oasis 12 with the latest installment of An Evening of Tiki at The Spare Room. Beverage Director Naomi Schimek has assembled a killer roster of guest bartenders for the monthly series, beginning in May with Julian Cox (Rivera, a 2012 Tales of the Cocktail Spirited Awards finalist for Best Restaurant Bar) and Zachary Patterson (Bagatelle). 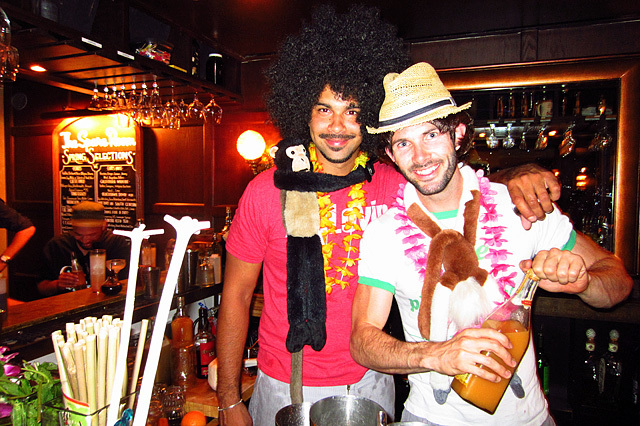 Cox and Patterson set the cocktail and costume bar high, and subsequent bartenders have stepped up. 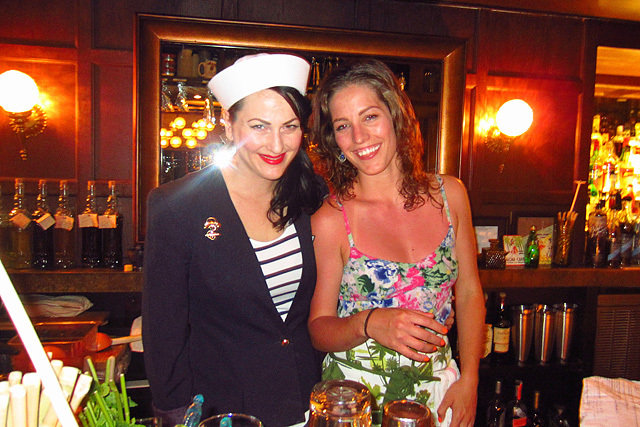 In June, Schimek welcomed Clover Club bartender and Speed Rack co-founder Ivy Mix, a Spirited Awards finalist for American Bartender of the Year. 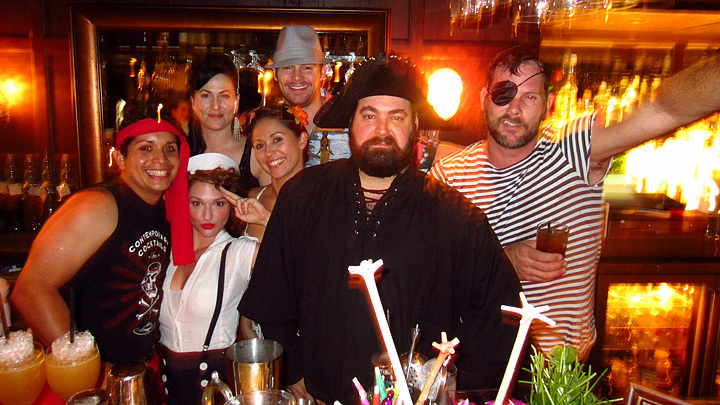 ARRR: Marcos Tello (far left) and Jason Schiffer (black beard) lead the motley crew. Last month saw a reunion of two of the principals from last year’s fantastic Tiki Nights at 320 Main, Marcos Tello and Jason Schiffer. Tello and Schiffer took no prisoners with a Pirate Tiki night of Schiffer originals and Tello’s historic LA tiki classics. On Wednesday, August 15th, An Evening of Tiki welcomes Richie Boccato of the acclaimed PKNY for what Schimek said will be “a full takeover of the entire space.” Joining Boccato behind the stick will be his wife Amanda, aka @LadyLillet. “Epic” is a word that gets thrown around too much these days, so let’s just say this is a night not to be missed. 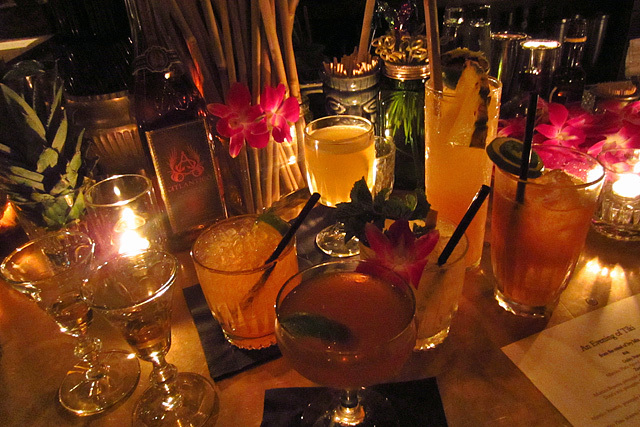 For more photos of the An Evening of Tiki series, please visit the Thirsty in LA Facebook album. 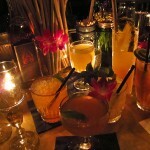 Speaking of tiki nights at 320 Main, the mainstay of the OC cocktail scene is celebrating “an evening of Polynesian Pop and Delectable Cocktails” with a Tiki Throwdown on Monday, August 20th. 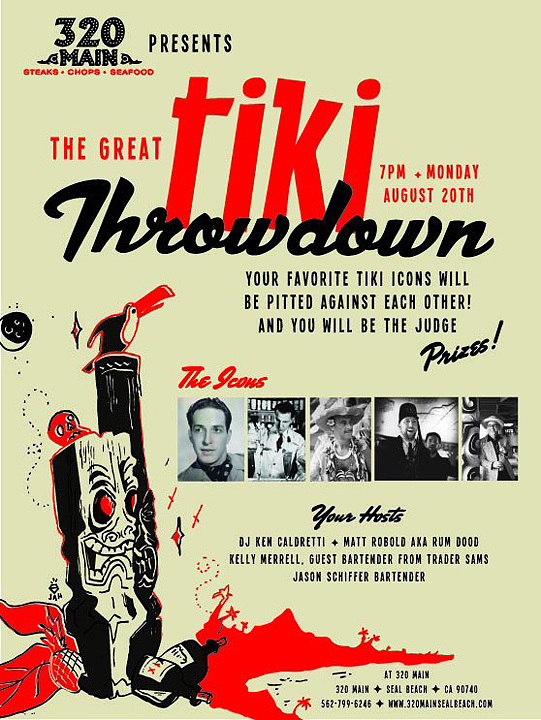 Expanding on the format of last summer’s Don vs. Vic battle, five tiki icons will be pitted against each other: Jeff “Beachbum” Berry, Martin Cate (Smuggler’s Cove), Stephen Crane, Don the Beachcomber and Trader Vic. As before, the tiki champion will be determined by popular vote. 320 Main’s Jason Schiffer and Matt Robold (RumDood) will be joined by Kelly Merrell from Trader Sam’s Enchanted Tiki Bar. 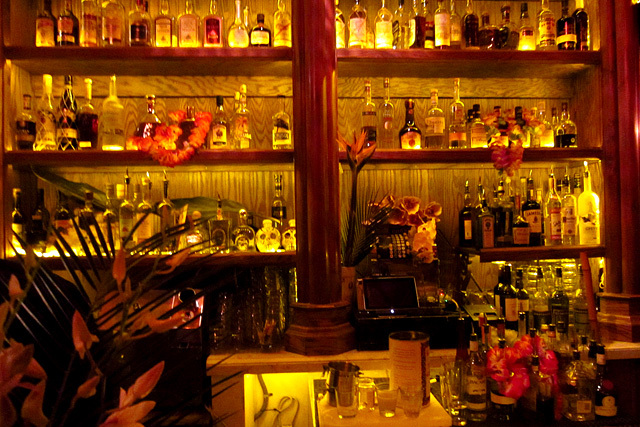 Don and Vic get have been getting their props at La Descarga, which recently debuted its Tiki Tuesdays weekly event. 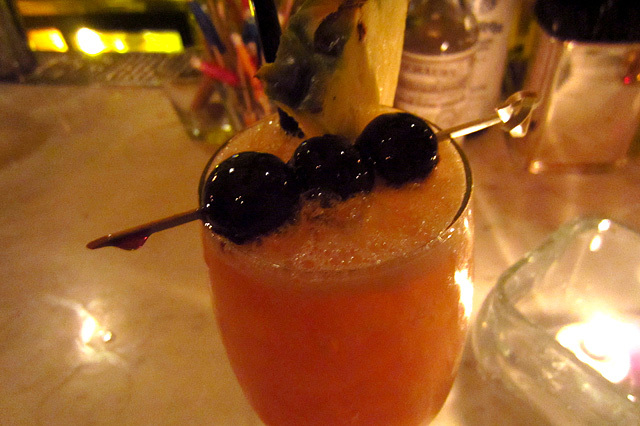 Head bartender Joe Swifka, who held the same position at Julie Reiner’s Lani Kai, launched Tiki Tuesdays with a ten-cocktail list that mixes classics and his own creations, such as the superb Black Magic Woman (a favorite from his stint at Bar | Kitchen). Swifka said he hopes to keep expanding the menu until it encompasses dozens of drinks. 3 Dots and a Dash: Rhum Clement VSOP, El Dorado 12-Year, Velvet Falernum, St. Elizabeth's Allspice Dram, honey, fresh orange and lime juices, Angostura Bitters. Big Bamboo: Blackwell's Dark Jamaican, Matusalem Classico, passionfruit, fresh lime, orange and grapefruit juices, Angostura Bitters. Going tiki every Tuesday is a good fit for the rum-soaked La Descarga: with splashes of tropical flowers and the house band playing Hawaiian slack key and surf guitar, you can practically hear the waves crashing against the shore.